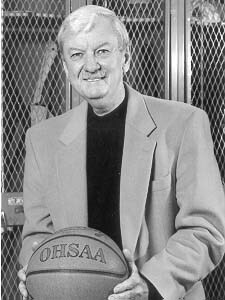 Fifteen years ago, Steve Smith came to Orrville to coach basketball. But Orrville is a football school, you say. He came with a record of 57 wins and 32 losses at Old Fort High School, and having taken their baseball team to the state finals. There was some trepidation in the minds of some when “Smitty” came to town. Today there is nothing but genuine love toward Smith, and not only because of the first team state championship had he brought to Orrville in March. He has the respect of everyone, because of the love he shows his family, his players, his coaches, (his scorekeeper), the fans and everyone else who comes in contact with him. Smith’s record the first year at Orrville was 18-4, the n18-3, 22-5, and a trip to Columbus in AA. The worst year’s record was 14-8, respectable in many circles. Sometime in the latter part of 1992, a cake could be cut, celebrating his 300th win in Orrville (now 398) and sometime in the 1994-1995 season, another cake could be cut to recognize his 400th career win (now 355). In 1964, Smith graduated from Shelby High School, having lettered in football, basketball, and baseball. He was MVP in basketball in 1964, averaging 17.5 points per game. Unfortunately, a football knee injury kept him from getting a basketball scholarship at a major school so he went to work in the steel mills for a time. In 1966 he volunteered to serve in the Navy during the Viet Nam war. By 1970 he was enrolled in Northern Arizona University, had a wife (Donna) and a son (Steve, Jr.). He was 25 years old as a freshman and averaged 10 points per game on the basketball team. Smith’s first teaching position was at Sandusky Perkins High School, where he was also an assistant football and junior varsity basketball coach. He then went to Old Fort for the seasons 1973-1977 as basketball and baseball coach. The story at Orrville is legend. Sectional champions 13 out of 15 years, District champions six times, Regional champions twice, and State champions once. Orrville won the All-Ohio Conference and All-Ohio League championships nine out of twelve times and second place the other three. Smith has garnered Coach of the Year at the District level seven times, League Coach of the Year seven times, Beacon Journal Wayne County Coach of the Year four times, and has coached in the 1990 North-South All-Star game. His record to date at Orrville is 298-60 (83%) and overall is 355-92 (79.4). in 1988-89, Orrville had its only undefeated season and ended at 22-1. This year the team ended at 27-1 with a State championship. Highlights for this year were a win over Firestone when they were undefeated and ranked #1 in Division I, Wadsworth undefeated at 16-0, also Division I, and Hiland, the eventual State Champions in Division IV. Both his sons, Steve, Jr. and Rocky played for Smith and probably had to work harder than most of the other player s to get to play for Dad. Smith was born and bred of hard work and it shows in what he has accomplished. Steve Smith is truly a Champion.